In podiatry, foot x-rays are commonly performed to assess the underlying bones and joints of the foot. X-rays area great at showing the bones in the foot, the structure and relationship between joints as well as whether bone spurs or other bony abnormalities are present. What x-rays are not able to show are tendons, ligaments, nerves, and certain masses or cysts. When there is suspicion of tears or damage to these ‘soft tissues’ as we call them, we will often enlist the help of MRI or ultrasound. These are referred to as ‘advanced imaging’ and help to more thoroughly assess your foot or ankle condition. Most people are familiar with the idea of an MRI, though don’t often consider ultrasound. MRI creates images of a static body part with the use of a large magnet. MRI’s show us anatomy of the foot and ankle in the form of hundreds of individual pictures (called slices), so that bit by bit the foot can be assessed for abnormalities. 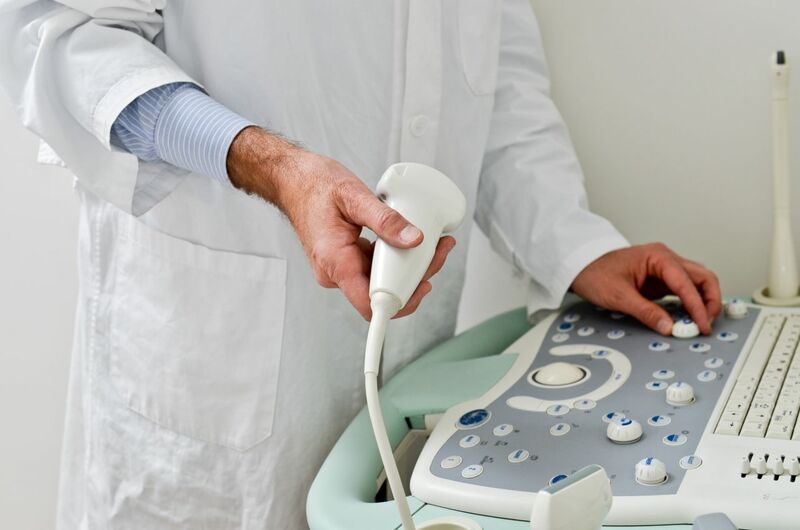 Ultrasound on the other hand uses sound waves and is able to provide both static and dynamic interpretation of the structures of the foot and ankle. When performing an ultrasound on the foot or ankle, a doctor can move the ankle or foot to see how the tendons and ligaments in the foot function actively. So how do we choose which to order? MRI is typically better at examining the underlying bone and deeper foot structures. If your doctor has a normal x-ray, but suspects that the issue is within the bone, and MRI can more specifically assess for swelling, tumors or stress fractures within a bone. MRI will also show tendons and ligaments well, however ultrasound for use on the superficial anatomy offers the benefit of no loss of image. In some condition, tears can occur that are very small and if an MRI is performed with a ‘slice thickness’ of say 4mm, a 3mm tear could be hiding between one picture and the next. Additionally, ultrasound has become more popular in foot and ankle due to the fact that the medical cost is lower. As with anything else, an MRI or ultrasound in and of itself cannot be entirely trustworthy. It also matters who is performing the MRI or ultrasound and what doctor is assessing the images. Our office typically refers patients to our preferred MRI location and our preferred ultrasound location to ensure that we get the most thorough and trustworthy read.